We heard from business customers that they love the convenience of shopping online, and want an experience at work that is similar to how they shop at home. 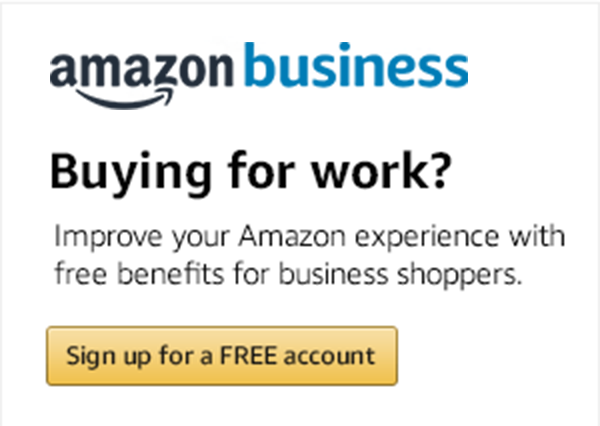 Amazon Business delivers an expanded marketplace that combines the selection, convenience and value customers have come to know and love from Amazon, with new features and unique benefits tailored to businesses such as business-only pricing and access to more than 85,000 business sellers. Negotiated pricing, which allows business suppliers to upload prices they have previously negotiated with specific customers to Amazon Business, creating one-to-one offers on Amazon Business that are only available to specific customers. Seller credentials, which provides business customers with the ability to meet specific sourcing requirements by refining their search for sellers with specific quality and diversity credentials. Quantity discounts. Amazon Business suppliers can now offer a variety of discounts for high-volume orders to customers to help them simplify business purchasing. These features and benefits allow Amazon Business customers to discover and create relationships with new and existing suppliers. In addition, negotiated pricing helps businesses move their purchases to Amazon Business in order to consolidate spend. And by allowing Amazon Business customers to search using specific seller credentials, we are providing a way for businesses to meet supplier diversity requirements and for suppliers to reach new customers. Negotiated pricing: Suppliers who sell to business customers on Amazon Business can now move contracted prices to the Amazon Business marketplace. When a customer is logged in and views a product with a pre-negotiated contracted price, the customer will see that price as well as marketplace pricing. To enable this feature, suppliers can list negotiated prices via Amazon’s supplier portals for each specific customer. Prices can be uploaded in bulk or on a product-by-product basis. Customers will begin seeing the contracted prices once they have reviewed the price list and verified the accuracy of the contracted price. Seller credentials: Amazon Business customers can refine their product search to include offers based on different seller criteria, including minority-owned, women-owned, veteran-owned and small business. Many businesses have specific supplier-diversity programs and requirements that make these distinctions critical to their operations. This was one of our most requested features from customers and we are excited to deliver this and help organizations meet their goals for diversity spend. Quantity discounts: Suppliers now have the flexibility to offer price break points at levels of their choosing, with up to five tiers. For instance, one product could be listed with different prices for 1-25 units, 26-50 units, 51-75 units and so on. This is visible only to Amazon Business account holders and are displayed when the customer clicks on the “quantity discount” dropdown on a product page. If a customer doesn’t see a quantity price on a specific product, they can also use the Request for Quantity Discount feature, which will alert sellers and enable them to provide that price break to customers through Amazon Business. Learn more about Amazon Business selling features, including business-only pricing and quantity discounts.